There’s something about eating homemade granola over a bowl of homemade yogurt that makes me feel, well, granola. And since that’s a good thing in my book, I sometimes go through a phase of making yogurt myself. This is a whole lot easier than it sounds, which is why people in places like the Middle East have been making yogurt for millenia. In fact, Persian traditions hold that Abraham owed his longevity to the regular ingestion of yogurt. While I doubt that’s true, homemade yogurt is better than any kind in the store and cheaper too. Once it’s made, we flavor it ourselves according to each person’s taste: honey, agave, peanut butter, vanilla and fruit are all delicious. And since making yogurt is, after all, a science, once in a while, it doesn’t work out. For those occasions, we use the batch for recipes like smoothies, biscuits, taco salad dressing and pancakes. 2. Once it’s boiling, sterilize your thermometer and a large spoon by dipping it in the water. 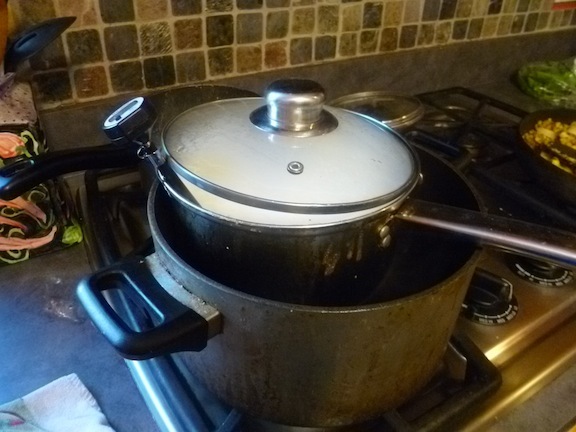 3, Make a double boiler (I’m assuming most people don’t have one!) 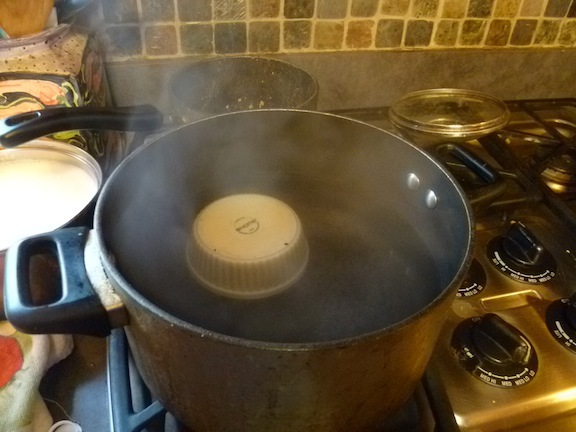 by putting a ceramic small bowl in the pot so that your smaller pot will rest on top of it. You could use a double boiler instead! 4. 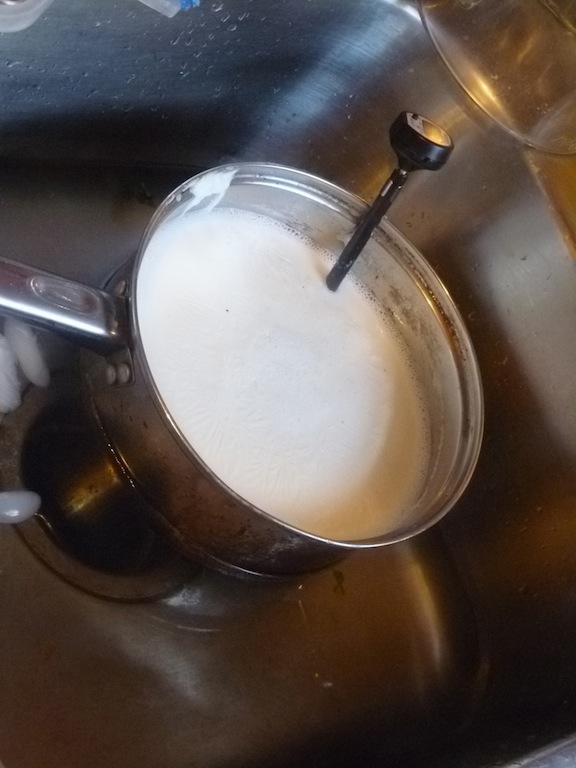 Pour milk in your smaller pot and place in the pot with boiling water. Clip your thermometer to the side. 5. Here’s where you enlist a young scientist. As long as you trust your kid’s not going to touch the pot or flame, plop him or her on top of the counter to watch the temperature. The milk needs to reach between 185-190 degrees. Before it does, though, give it a couple of stirs. 6. 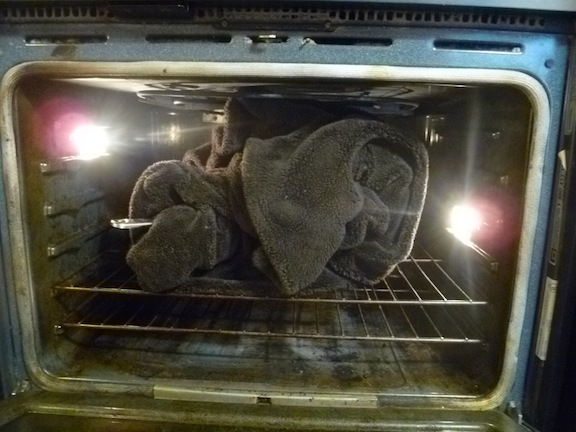 Once it reaches 185 degrees, uncover the pot and place it in your plugged sink with cold water and some ice. Tell your young scientist to inform you when the temperature reaches around 112 degrees (between 110 and 115 degrees). Stir it to make sure it is consistently that temperature. 7. Stir in your tablespoons of yogurt. 8. Replace the lid and wrap the whole pot in a warm blanket. 9. Place the insulated pot in your oven TURNED OFF! with the light on. 10. Open the oven after 5-6 hours to discover the most incredible yogurt you’ve ever tasted. Unless you’ve never tasted plain yogurt. In that case, add some honey and eat until your heart’s content.